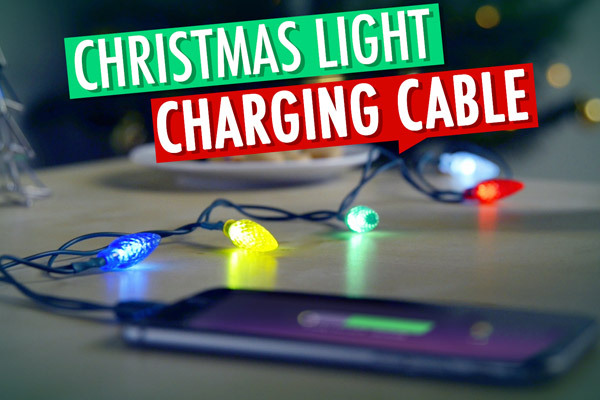 Christmas Light Charging Cable: Lightning charging cable with Christmas lights. Make spirits and screens bright with the Christmas Light Charging Cable. 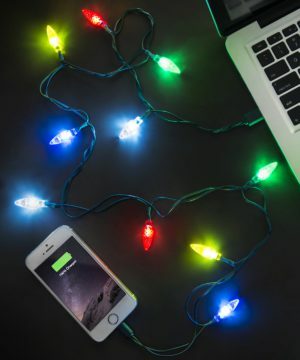 The USB-to-Lightning cable charges iPhones, iPods, and iPads while ten different LED lights shaped like a string of classic Christmas lights shine. This year, deck your halls with boughs of holly and your desk or night stand with a Christmas Light Charging Cable. Even when it’s not connected to an Apple device, the festive bulbs glow with holiday cheer as long as the cable has a power source.